The SOVA Aero Night Guard Custom-Fit Dental Mouth Guard provides protection against oral health issues—such as teeth grinding and clenching, and bruxism caused by TMJ—that can lead to headaches, damaged teeth and jaw pain. 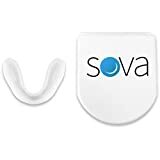 Made to withstand extreme chewing and grinding, the 1.6mm thick, ultralight SOVA guard is tougher than basic night guards, thanks to non-compressible, non-toxic materials that distribute force over the entire perforated surface of the mouth guard. One-of-a-kind Diffusix technology dissipates grinding forces, protecting against issues that can cause and perpetuate jaw pain, ensuring a better night’s sleep. The optimized design and perforation pattern promotes the natural flow of air and saliva, making it possible to breathe and drink easily while wearing the ultra-thin, odor and taste-free night guard. Customizable and remoldable up to 20 times, it’s easy to achieve the perfect fit without a costly trip to the dentist. The mouth guard is even compatible with braces, but a dental professional must be consulted for proper fitting. The SOVA Aero Night Guard is available with or without a ventilated carrying case, and is easy to clean using soap and water and/or toothpaste and a toothbrush. Made in the USA.